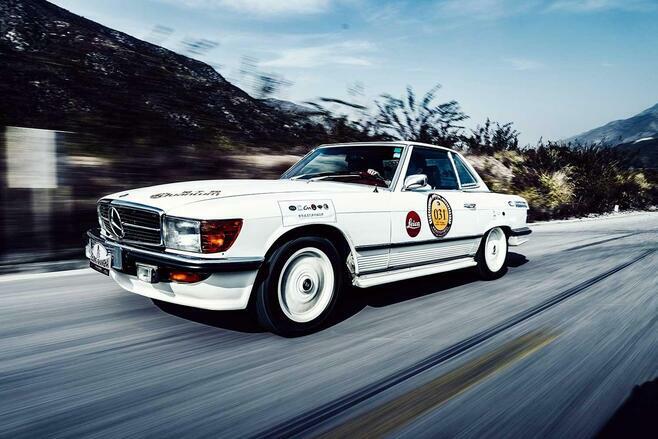 How is the motion blur produced in these pictures? Depending on the technique used, we can distinguish three different types of motion blur: the object moves (time exposure, for example), the camera moves (zoom effect, artificial unsharpness), or the camera and the object move (“panning”). While moving objects appear blurry when photographed in daylight with a longer exposure, thanks to motion blur, points of light appear as lines when photographed in the dark. Without this gimmick technique, the effect would also remain unperceived by the human eye. 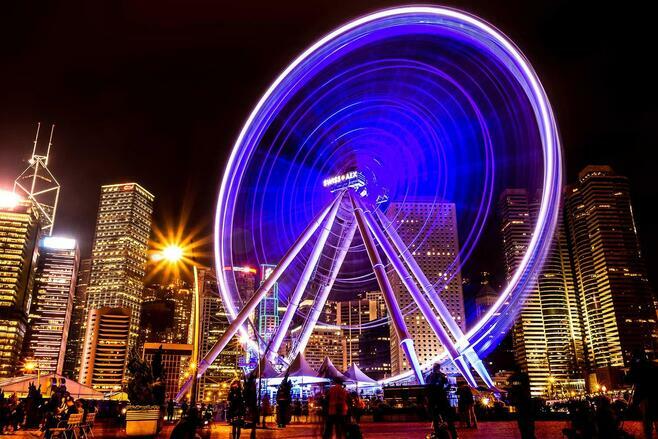 In this image, the photographer has traced the movement of the big wheel that, lit up at night, rises majestically above the city. In this case a very long, 30-second exposure was used, so as to capture enough light information. In addition, the photographer opted for a small aperture, f/16, and a low light sensitivity of ISO 100, which led to a larger depth of field and less colour noise. Please note that longer exposure times produce a stronger appearance of dark noise and, when using film, of the Schwarzschild effect. In this picture, the photographer manages to get the lights of the big city to appear like sun beams in a painting. 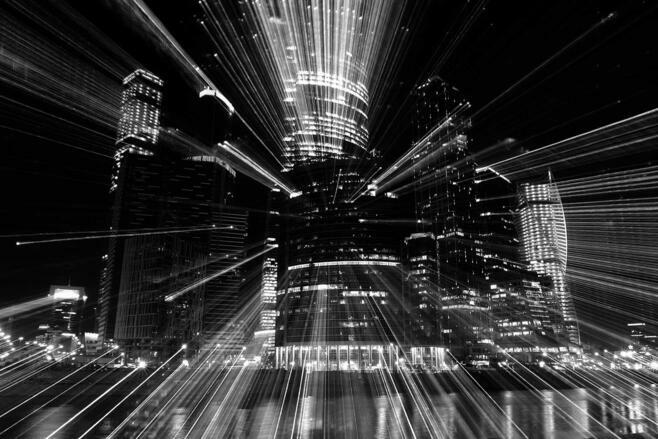 This accentuates the architecture in the middle of the image, from where the beams of light scatter outwards like an explosion. This effect creates the feeling of being drawn into the picture as you look at it. To take this picture, the photographer opted for a very small aperture, ensuring that only a little light would fall on the sensor. Consequently he was able to reach a 25-second exposure time, while minimising the danger of shakiness. During this time frame, he was able to manually apply the camera lens’s zoom function in a controlled, slow and even manner, with the help of a tripod. It is important to calculate in advance the approximate length of the beams, or, alternately, the path the zoom should follow. This picture could also be titled “Pure Joy”. Once considered a deficiency, motion blur, is used today as an artistic, photographic tool, able to produce a strong emotional impact, as seen here. The exceptional interplay between the “panning” technique and the central feature in the image, allows the viewer to slip into the role of the person being photographed. With good light conditions, the photographer had to close the aperture so that, with 1/8th of a second, the background is blurry, while the expression on the face is recognisable. He managed this by panning the camera in a way that was synchronised with the child’s movement. A certain amount of “shakiness” is inevitable but secondary, and should not stop you from using this technique. In this kind of situation, better to take too many pictures than too few. This image thrives from the fact that it captures something our eyes can not normally see. In this case, the photographer is actually drawing with light – the very essence of photography. An exciting and well-composed picture full of opposites – bright and dark, hot and cold, old and young – and multi-layered perceptions. In the scene, the stroke of the hammer is the opening chord, while the explosion is the closing one: direct like the sparks, and elusive like the smoke. 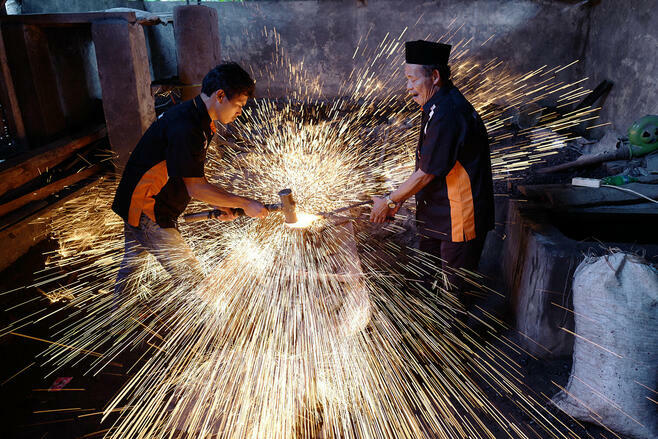 In this case, for the motion blur effect, the photographer deliberately used a relatively short exposure time, so as not to overrun the decisive moment, on the one hand, while capturing the sparks and their flight paths, on the other. He managed to do this very successfully, by setting the aperture wide open with an exposure time of 1/40th of a second. It is as though the viewer can actually hear the stroke of the hammer. Have you ever been inside a particle accelerator? You might expect it to look something like this. Intoxicating speed and the unknown lying just around the bend. The reduction to black and white and the streaking lines underline the incredible dynamism of this picture, drawing the viewer into a time tunnel. The photographer managed to take this picture during a train ride. He did not actually move the camera, rather he and the camera moved together. 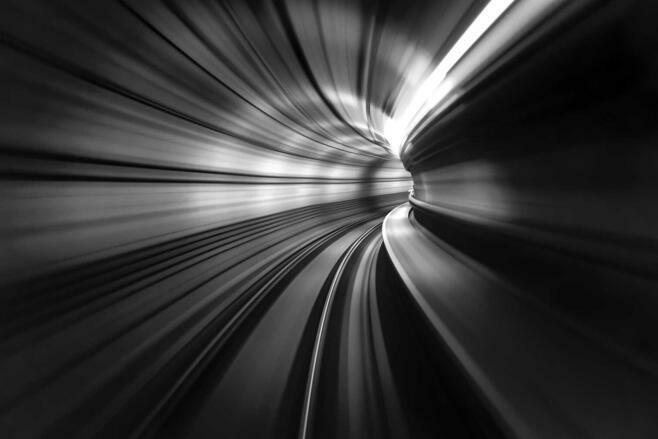 With the train’s high speed, it was enough for him to find a stable position and set a time exposure of one second with a nearly fully open aperture, to be able to take this futuristic-looking picture. A longer exposure would have made the motif completely blurry. The visual result in this photo is comparable to the zoom effect. This picture is an example of how you can be a master of impressive nature photographs using motion blur. In this case, the photographer has managed to unify the constant movement, the fury and the effervescence of the waves, imbuing the image with a baffling atmosphere. 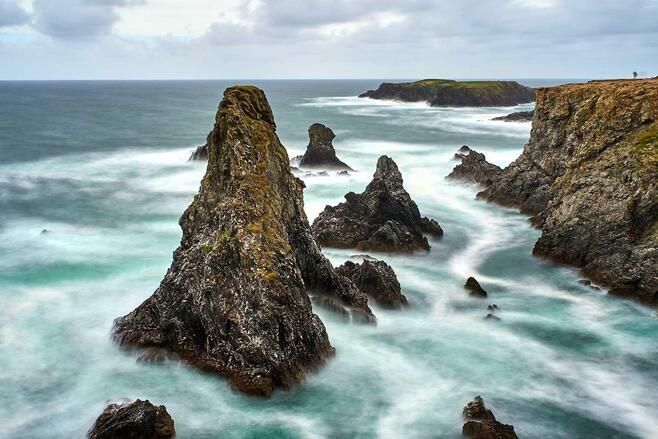 Framed by a white, mist-like fuzz, the sharp and craggy rocks and cliffs become central to the image. This virtually hyperreal reproduction of the finest detail creates a tension that moves the viewer to spend more time looking at the picture. To capture the detail-rich aspect of this impressive landscape, the photographer used a small aperture and low light sensitivity. A half-minute exposure, a tripod and a remote-control release, were necessary to capture the motion blur. A suitable ND (neutral density) filter can further strengthen the exposure and the motion blur effect. 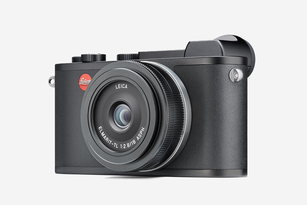 Experience the magic of motion blur in our Leica Stores around the world. 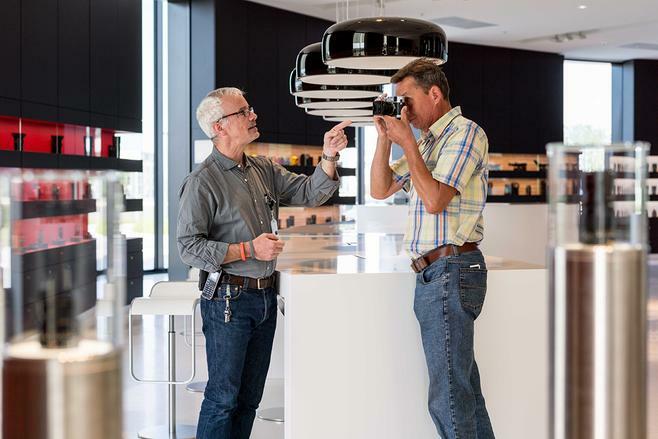 Our Leica Stores are meeting places that offer dialogue and opportunities to experience the world of photography. Our staff and photography experts look forward to sharing their knowledge and know-how with you in person, offering you constructive and encouraging support across a range of technical and photographic matters. 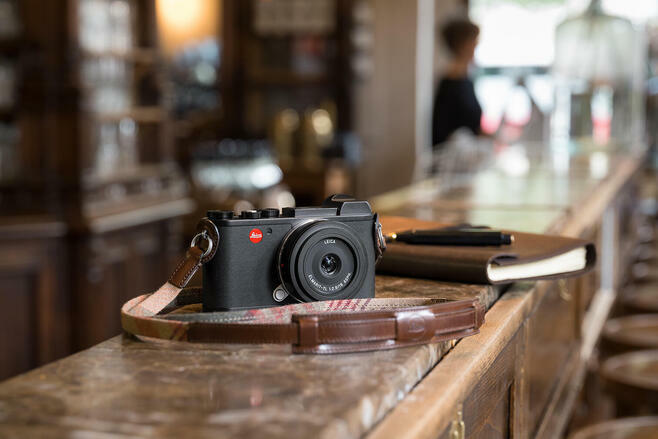 With the Leica Newsletters, you can be the first to read all about the latest products, Leica services and events – precisely matched to your personal interests. Get plenty of inspiration from pictures you can find at the LFI Gallery; and capture your own moving moment. 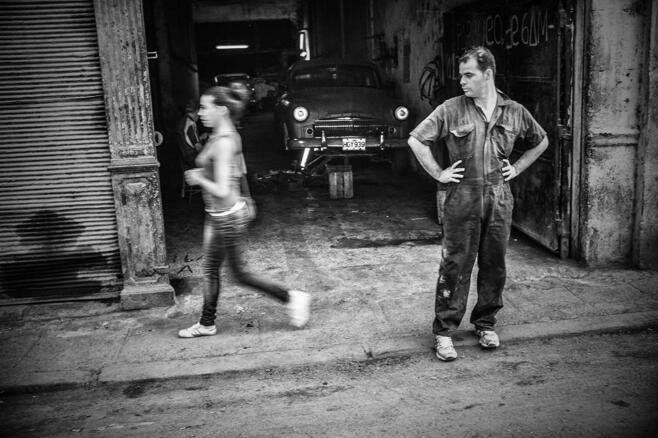 With a broad selection of photo workshops, the Leica Academy offers you practical and intensive experience in every area of photographic creativity. 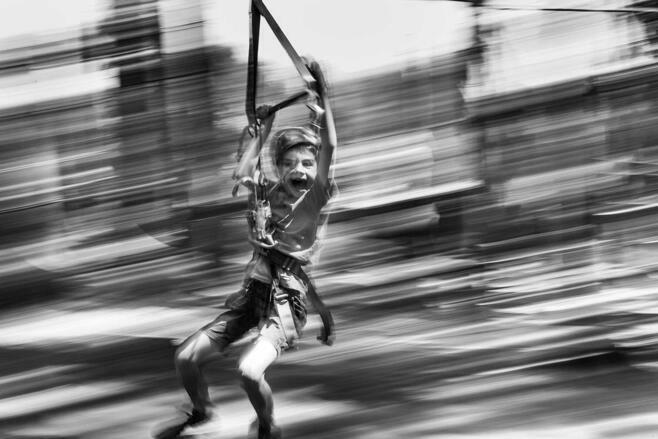 How to produce imaginative pictures using motion blur is just one of the aspects covered by the Leica Academy. Enrich your creative photography and let yourself be guided towards the best possible image results. There are different techniques and aids for producing the various types of motion blur. 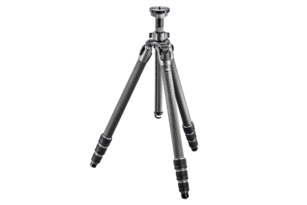 For shake-free, long exposures, a stable and compact tripod is indispensable. 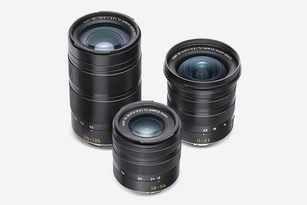 For the so-called “panning”, the handy, high-performance Leica CL is an excellent option. With the proper Vario lenses with wide-angle, portrait and tele focal lengths, this APS-C camera is also the perfect tool for the zoom effect. Equipped with this gear, there is no longer anything stopping you from always producing exceptional motion blur images.